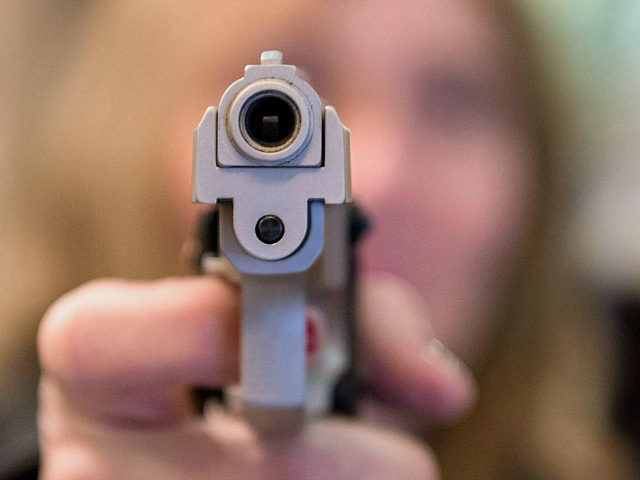 A suspect in Sterling Heights, Michigan, allegedly grabbed a woman from behind then fled when she pulled her concealed carry handgun and pushed the barrel against his stomach. The incident allegedly occurred “near 15 Mile and Van Dyke” during evening hours, as the woman was walking her dog. The woman said she noticed a suspect get out of the van and that he “started walking parallel to her.” She instinctively reached under her coat and put her hand on the handle of her gun. Then the man disappeared. This incident is critical for understanding defensive gun uses (DGUs) in America, as many DGUs prove successful merely by brandishing a gun rather than pulling the trigger. On February 17, 2015, Breitbart News reported that Florida State criminologist Gary Kleck reaffirmed his estimate of a minimum of 760,000 DGUs in America each year. He first began working on this estimate on 1993 and it has yet to be refuted with empirical evidence. A large portion of these 760,000 DGUs are instances in which guns are justifiably brandished to stop crime, without the trigger ever being pulled. AWR Hawkins is an award winning Second Amendment columnist for Breitbart News, the host of the Breitbart podcast Bullets, and the writer/curator of Down Range with AWR Hawkins, a weekly newsletter focused on all things Second Amendment, also for Breitbart News. He is the political analyst for Armed American Radio. Follow him on Twitter: @AWRHawkins. Reach him directly at awrhawkins@breitbart.com. Sign up to get Down Range at breitbart.com/downrange.